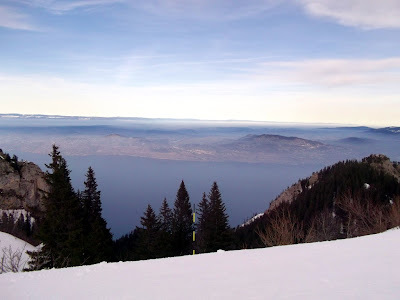 I read ages ago about Thollon les Memises, a ski station high above the lakeside town of Thollon where you are able to ski whilst overlooking the glorious expanse of Lake Geneva or Lac Leman as the locals call it. Today was to be the day I would get to experience it. It is about 30 minutes drive from Geneva, next door to Evian les Bains, the town that gives its name to one of the most famous mineral waters in the world. It always seems odd to me that people would pay so much for virtually the same stuff as you can get from a tap or faucet for next to nothing, but "there's nowt as queer as folk" as they say in Yorkshire. Similar to yesterday's trip to the Roc d'Enfer, the day began overcast and a bit gloomy, but as I drove steadily upwards to Thollon les Memises the sky cleared and sunlight began to seep through the murk. The cost of a day pass was a paltry €19.50 the cheapest lift pass I have come across this season, remarkable value. 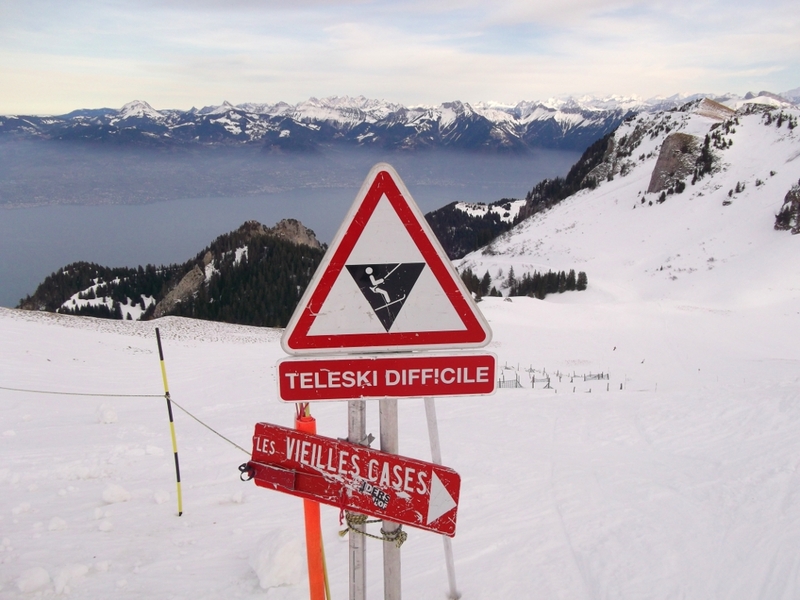 From the village you ascend to snow level by an ancient four seater "bubble" lift. The interior smelled like it had been freshly hand painted and in a fetching retro shade of battleship grey too. It had very functional unpadded plywood seats. It all looking like something from a 1960's James Bond film, if Ernst Blofeld needed a bubble lift system, this would have been the one he would have signed the cheque for. I hadn't seen the ubiquitous SnowScoot outside of any of the ski hire shops in town and the chief liftie confirmed my gut feeling that such "Nouvelles Glisses" were prohibited here; today was to be another ski centric day. I made my way around the runs on offer, of which there are a good selection. There is one large modern chairlift that serves as the infrastructure back bone with a few small, old fashioned ones acting as key links. A fair few drag lifts serve specialised areas such as the slalom area, some steep red runs and the snow park. I surprised myself by attempting two of the steep reds pretty much straight away. The sign for the drag lift alongside the slope warned that the gradient was over 50% and the local ski clubs were holding a slalom competition on the blue run adjacent. Having managed to get my skibike down some pretty nasty runs recently, just getting me and my tiny lightweight skis down didn't feel like that much of a big deal. It was the ideal opportunity to work on my carving technique, something definitely clicked and for once it wasn't my knees. It was a great feeling to engage with the icy snow, I can see know why people rave about getting their skibikes to carve, it inspires great confidence. Having been over the same runs quite a few times I was eager to find a fresh area to explore. A study of the piste map revealed an interesting "back mountain" loop, similar, but smaller, to the one I tried at Roc d'Enfer yesterday. This turned out to be an absolute gem of a run. It started steep and narrow, then opened out into a wider, but still steep, slope. It then narrowed right down to the width of a mountain road, following a cliff edge, before opening up again into a roller coaster of fast dips and bumps. The last section began to funnel down and leave you at the bottom of a gorge, miles from anywhere. It was so remote that the "difficult" drag lift was powered by a diesel engine. This pulled you along a level traverse and to the start of a charming cross country path through delightful pine forest. Lastly there was a small chairlift to get you back up the mountain and close to your starting point. In the morning I hardly saw anyone, even at 11am I was able to leave fresh tracks. Furthermore the loop seemed to be the exclusive preserve of intermediate skiers and above. Not having to worry about school groups or wobbly beginners and being able to go fast in safety was a delight. In conclusion, Thollon les Memises is a great ski station, the expanse on offer high above the town is an unexpected surprise. It would be brilliant if they could entertain skibikes, the Parchet chair lift would be the perfect uplift and would give access to a fair chunk of the area. Even the loop I enjoyed so much would be possible, providing you didn't mind hoofing the 100 metres or so that the drag lift provides for skiers. Who knows what the future will bring, things have changed so much elsewhere.